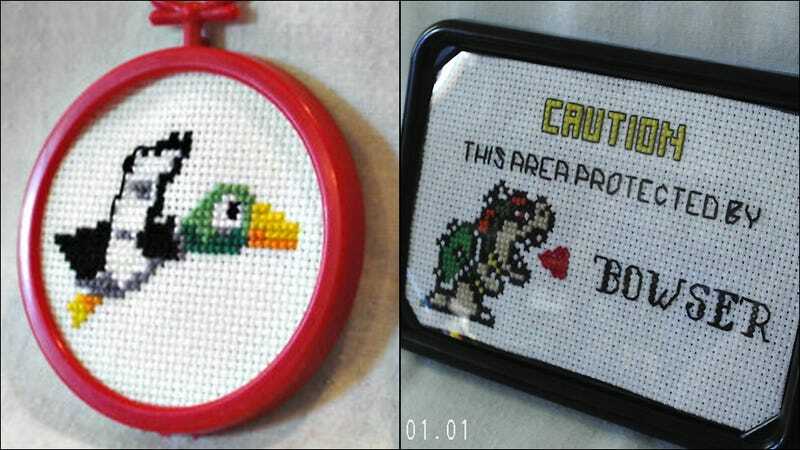 Cross-stitch is the perfect medium for 8-bit and 16-bit fan art. Have you ever seen one of the patterns crafters use? They look like pixel art! They're little grids of color, showing which block goes where, in what shades, to add up to a visible whole. And the craft itself is pretty retro, invoking images of samplers sewn into pillows in every variety of "grandma's house" that society has to offer. Happily, the folks at Kill Screen have found one crafty Etsy seller who's understood the connection all too well. Her shop also features carefully embroidered memes, other classic gems, and my personal favorite, a certain infamous riddle. A retro craft to honor retro games? Seems perfect to me!